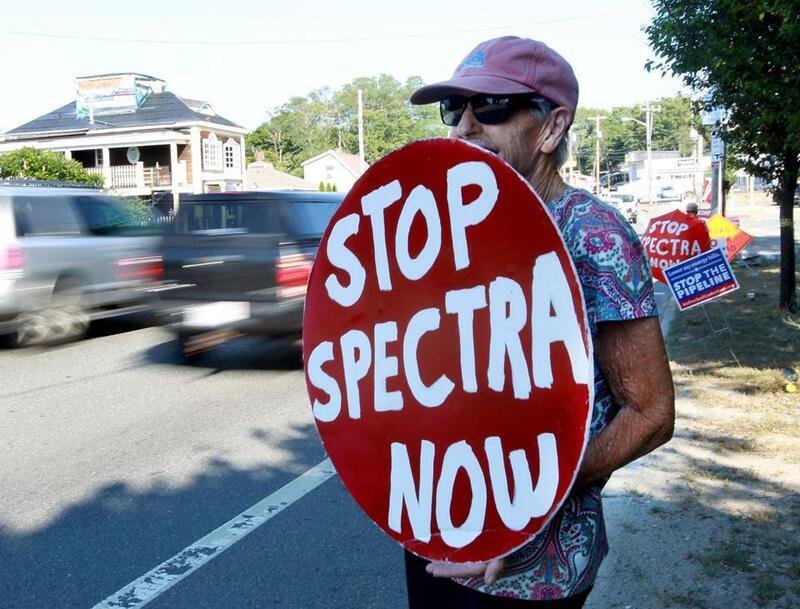 Protestors opposing construction of a Spectra Energy natural gas compressor plant lined the roadway coming off the Fore River Bridge by the plant site in Weymouth, Mass. Canadian pipeline operator Enbridge has sued the Town of Weymouth in federal court, the company’s latest effort to gain a legal path to build a natural gas compressor station next to the Fore River. Enbridge wants the court to rule that federal law preempts the town’s zoning, which currently poses an obstacle to construction of the station. The company says the compressor station is crucial to its Atlantic Bridge project, which is aimed at improving the capacity of Enbridge’s Algonquin and Maritimes & Northeast pipeline systems, which together stretch from New Jersey to Nova Scotia. But Weymouth has battled Enbridge and Spectra Energy, a pipeline company that was acquired by Enbridge last year, at almost every turn, spending more than $700,000 on legal costs to fight the project over the past four years. Federal law gives energy companies wide latitude in local disputes. Enbridge appears to be banking on that fact with its latest lawsuit, filed against Weymouth on Thursday in Boston. In it, Enbridge asks for a judgment that a local zoning ordinance is preempted by the federal Natural Gas Act. It also wants a permanent injunction to block Weymouth from using its ordinance to interfere with Enbridge’s efforts to secure state and federal approvals. Callanan said the controversy has sparked at least 10 lawsuits or administrative appeals. At particular issue in the latest legal round is a law specific to Massachusetts that governs waterways and filled tidelands. Enbridge needs a so-called Chapter 91 license to build the compressor station, and Weymouth contends that the rules for such a license require conformance with local zoning. Callanan said the project’s coastal location means that zoning rules play a much bigger factor in state and federal permits than they would for a more inland energy project. An Enbridge spokeswoman said the Weymouth site is the preferred location because it’s an industrial property, would not have any direct effect on wetlands or woods, and would not require additional pipeline construction beyond the compressor station property. The spokeswoman said about 40 percent of the Atlantic Bridge upgrade project’s capacity would be used in Connecticut and Massachusetts.The rest would be used in northern New England and in the Canadian Maritime provinces. The compressor station would help send gas toward those locations. Alice Arena, a Weymouth resident who has been helping to lead the opposition, said she wasn’t surprised by Enbridge’s latest legal maneuver.